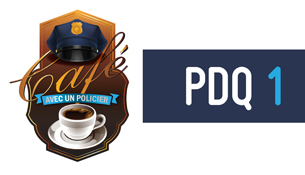 Police officers from neighbourhood police station 1 invite citizens from Baie-D'Urfé, Beaconsfield, Kirkland, Sainte-Anne-de-Bellevue and Senneville to come and discuss with them in the framework of the event Coffee with a cop. Time: From 9 a.m. to 11 a.m.
Coffee with a cop is an informal event which allows police officers and citizens to meet in a neutral environment to facilitate the dialogue. The aim of this activity is to let anyone discuss freely and exchange on various public security topics and concerns that affect the community members. In addition, this is an opportunity to strengthen police relations with its citizens, who normally meet in emergency circumstances that are very emotional. With Coffee with a cop, citizens get to know PDQ 1 police officers in a friendly atmosphere.